Most dog owners find the process of clipping their dog’s nails quite intimidating, especially large dogs—and with good reason. One wrong move and you’ll have blood gushing from your dog’s nails. Here’s why. Within the dog’s nails, there’s a nerve and a blood vessel commonly known as the quick. Cutting the nail too short will result in bleeding. 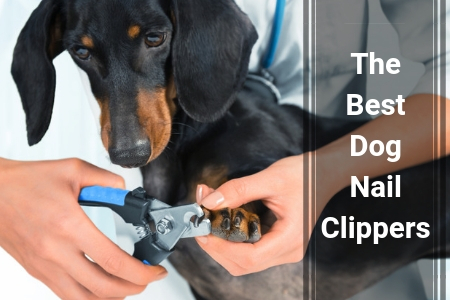 That’s why it’s important to pick the right dog nail clipper, dog nail trimmers, nail grinder, or nail file to ensure a clean cut and to avoid any pain and discomfort for your four-legged pal. 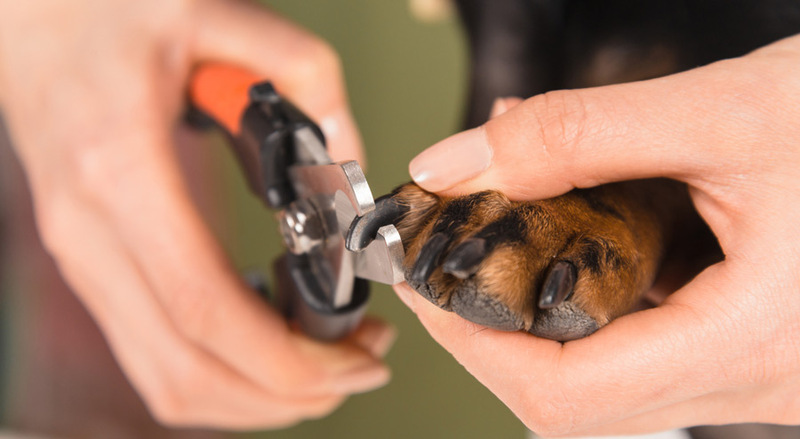 Not sure where to begin?In this article, we’ll be outlining everything you need to know about dog nail clippers—plus a few recommendations. Hopefully, we’ll help you make this process as simple and comfortable as possible. Is Clipping Your Dog’s Nails Really Necessary? You might be wondering if clipping your dog’s nail is really necessary. After all, their cousins in the wild seem to be doing just fine with their long nails, right? Well maybe, maybe not. Chances are, for animals in the wilderness, their nails are likely to wear down naturally. This is because they walk long distances, plus there’s constant hunting and climbing. Your dog won’t participate in any of these activities. So, that’s where you come in. You need to manually clip their nails. Either that or they’ll simply use your furniture and carpets to try and wear them down. Clipping your dog’s nails is more than just a cosmetic issue. It’s in your dog’s best interests to clip the nails for the following reasons. Just as human long nails harbor a lot of dirt and bacteria so do dog’s nails—if not worse. That’s why it’s advisable to keep the nails short and clean to avoid any unnecessary infections. Contrary to public opinion dogs walk on their toes, not on their pads. When a dog’s nails grow long, they tend to curl under and grow into the paw pads.As you can imagine, this will result in great pain and discomfort when walking. In an attempt to adapt their walking or running to deal with the discomfort, it causes sore feet & legs. Extreme cases can lead to stress being exerted on the joints resulting in pain and arthritis. Untrimmed nails have a higher chance of catching onto things resulting in breakage to a painful level. In severe cases, it can even rip off causing serious injuries. Now that you realize the importance of this procedure, can you perform it? And, yes, there’s a trick too if you want a successful and painless process. Sure, you could always take it to the vet for trimming if you have doubts but why not turn this into a bonding session? Regularly check your dog’s nail length. Even if you don’t physically check them, if you notice your dog limping then it might be time for a trim. Constant licking of feet can also be an indication that they are hurting. As mentioned earlier, if you trim the nail too short you risk cutting the quick. The process is much easier if your dog has clear or light-colored nails because you can easily distinguish the cutting point. It’s a bit different from the dark-nailed dogs. You can consider shining a bright light on the nail to determine where the nail ends and where the quick begins. Use the correct tool. Improvising with human clippers simply won’t cut it because they aren’t strong enough for the tough nails. Which brings us to our next point: picking the right nail clippers. Before you can purchase one, what you must know is there are three main types of nail clippers as outlined below. This is the more traditional form of nail clippers on the market because it’s relatively simple to use. As the name suggests, these clippers resemble the shape of scissors and also works like one. With this clipper, you need to exert considerable force to cut through the nail. As such they’re best suited for the larger breeds. These dog nail clippers get their name from how they work—exactly like guillotines. All you do is place the end of your dog’s nail into the hole of the clipper then squeeze the handles together. It’s that simple. This action will lower the blade thereby gently slicing off the end of the nail. This type is best suited for the small- to medium-sized dogs. What you must know is most dogs find this motion a bit painful and scary. If you’re a first-timer, you can consider using the conventional scissors clippers. However, if your dog is already used to this style of clipping, then, by all means, go for it. Unlike the other two types mentioned above, this clipper has more of a grinding than cutting effect. If you want a less stressful option then this might be for you. You can also consider this tool for the larger dogs with thicker nails. In addition, if your dog hates the feeling of clippers you can try these. However, bear in mind that this process will take considerably longer than when using the clipper. It’ll also take some time for your dog to get used to the vibration sensation associated with these grinder tools. Now that you know the types at your disposal, let’s discuss what things to look out for before picking one. Safety has to be top of your list before picking a dog nail clipper. As mentioned earlier, you want to avoid cutting the quick. Therefore, opt for one that comes with a nail guard as this feature is specifically designed to avoid trimming into the quick. Speaking of safety, we’re not only concerned about your dog’s safety but you and your family as well. This means you must opt for a dog nail clipper with a locking mechanism. It will come in handy when not in use to avoid accidents especially if you have children in the house. You want this process to be as quick and comfortable as possible for you—and your dog. Invest in a clipper which features an ergonomic design; one which aligns according to the natural contours of your hands. Not only will this greatly reduce hand fatigue but you’ll also cut through the nails quicker. In addition, it will minimize the risk of accidental nicks because of a tired hand. 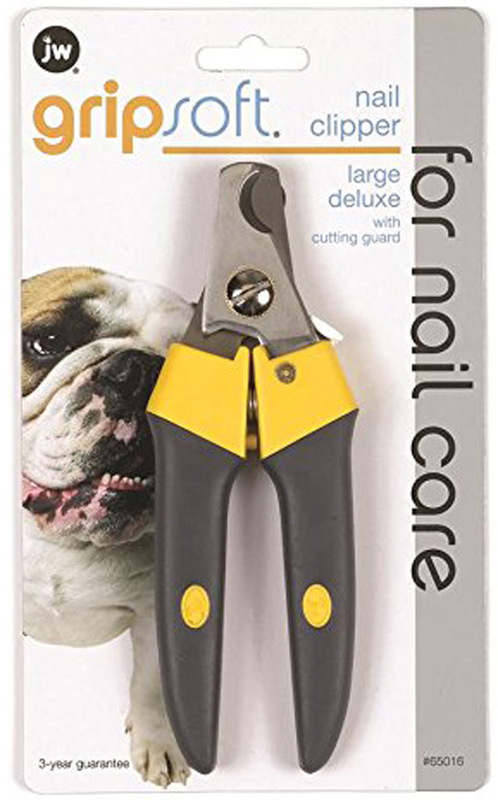 These dog nail clippers aren’t a one-size-fits-all tool. Because they’re available in different sizes you can pick the one that matches your dog’s nail thickness and paw size. Using a large clipper on a small puppy will just hurt your pup’s fragile nails. Large nail clippers have thicker blades so rather use them on your bigger dogs with tougher nails. While on the subject of size, note that different breeds have different paw sizes which you must consider before picking a clipper. Some breeds such as the Newfoundland have very large paws. Therefore, you’ll probably need the larger clipper for this type. For the smaller breeds, small- to medium-sized nail clippers will probably work just fine. It’s important to consider the thickness of the blades as it’ll determine how quick the cutting process will be. Typical blades are between 3mm and 5mm thick. Thicker blades are best suited for the larger dogs and the opposite is true. Also, you can expect a much quicker nail trimming process with the thicker blades. What Are Dog Nail Clippers Made Of? The material used in the construction of the clipper—particularly the blade—is equally important as it’ll ultimately determine durability. Apart from lasting longer, heavy-duty blades are ideal as they’ll stay sharper for longer. The last thing you need is a blade you have to regularly sharpen or replace after just a couple of trims. Just how well does the clipper cut? This will depend on a lot of factors, for instance, the opening and closing mechanism on the cutter. Ideally, it must be as smooth as possible to allow for a quick nail cutting experience. If you have to exert too much force you may end up hurting your dog—or yourself. The performance of the blade also largely depends on how sharp the blade is. Blades with blunt edges will just crack your dog’s nails instead of cutting them. A sharp blade is always a good idea if you don’t want your dog to end up with disfigured nails. To make this process as pleasant as possible there are a few things you need to take into consideration. Remember this every time a new dog joins your family so you can teach them some of these habits too. Avoid the dull and dark areas and move into a well-lit area so that you can see exactly where—or where not—to trim. Outside the house and under the bright sunlight is always a good idea. If you own a puppy you might want to start this process earlier so they become used to this procedure as they grow. Ask any dog owner and they’ll tell you most dogs don’t like their feet being touched. Regular feet massages will help them get used to the idea of their feet and nails being touched. This will also make the nail cutting a more soothing experience. You can consider giving your dog a treat as an incentive to sit still during the procedure. Either that or you can give it to them as a reward after each session. This gives them something to look forward to. Try to be very calm and gentle during this trimming process as this will also greatly relax your dog. If it happens to sense any anxiety whatsoever, he will react to it. If you’re a first-timer at clipping nails or really nervous it’s okay to ask for a helping hand. After all, two sets of hands always make it much easier and better than one. Finally, make sure you use the appropriate tools for this cutting process. This is not the time to be experimenting or improvising with different objects. Picking tools not specifically designed for dog nail trimming simply won’t work. This is why we’ll give you a couple of recommendations in the next section. After considerable research and comparing different products on the market, we have found the JW Pet Gripsoft Deluxe Nail Clipper to be one of the best around. What we like about this product is it combines the necessary features where performance, durability, and safety are concerned. This dog clipper is available in different sizes ranging from small to large. You’re bound to find one that matches your dog’s nail thickness. First off, this is generally a heavy-duty clipper which means not only will it last longer but it’ll stay sharper for longer. You won’t have to worry about regular sharpening or replacement of the blade on this clipper which makes it a cost-effective option. For your dog’s safety, it features a built-in nail guard. As mentioned earlier, this feature will eliminate the risk of cutting the nails too short, potentially resulting in bleeding.Note that this guard though not removable is adjustable. You can move it to either side so it doesn’t interfere with the clipper part during cutting. In addition, the clipper handles have non-slip properties for easier handling. This means you don’t have to worry about any accidental nicks during the nail trimming process. Compared to the other brands, it’s pretty easy to use. You won’t have to exert much force as you cut which allows for quicker and comfortable cutting. While on the subject of performance, you’ll appreciate that the blade completely opens to resemble a pair of scissors. You’ll find this particularly useful when you want to cut any ingrown nails that have grown into the paw pad. Weighing only 0.8oz., you can tell this is a relatively lightweight clipper to prevent any hand fatigue during trimming. Overall, if you’re looking for a high-performance nail clipper, then this might be a good place to start. This clipper softly clips without the loud “snip” which freaks out a lot of dogs. This is the non-deluxe version of the same brand, JW Pet. It functions more or less the same as the deluxe. However, the main difference is it’s slightly cheaper making it ideal for those working on a budget. Like the deluxe nail clipper, it also features a cutting guard that helps prevent you nipping into your dog’s quick. The blade is made of stainless steel which guarantees some degree of longevity. Plus, it also features a non-slip grip for easier handling making the cutting process a pleasant one for you and your dog. This is because the handles are rubber coated for easier gripping. 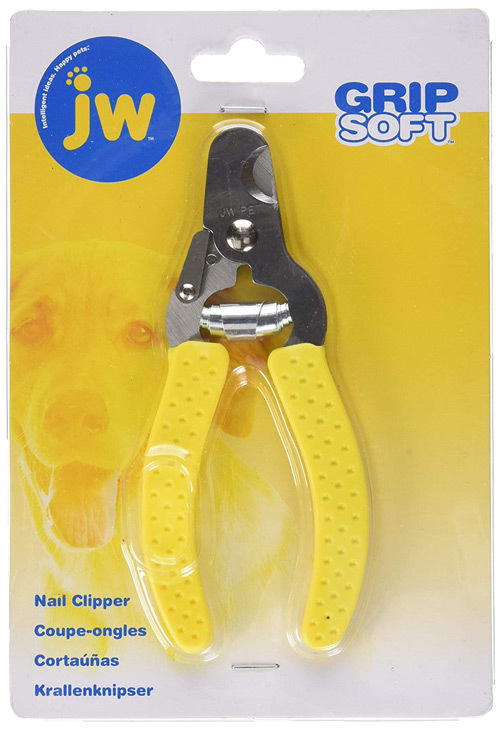 Like all JW Pet nail clippers, not only is it a safer option but it’s also very easy to use. This is largely due to the spring mechanism which allows for smooth operation as you cut. What sets it apart from the deluxe nail clipper is it can be turned quite comfortably into varying angles depending on how you want to trim. This means you can expect a smooth and quick nail cutting process if you pick these. You might also appreciate that they’re lockable when not in use. This greatly reduces the risk of injury as you retrieve them from the cupboard drawer. We particularly like this set,which allows you to cut your dog’s nails even when it’s asleep. That’s how good & efficient they are. So, if you’re a first timer these smooth cutters will definitely set your mind at ease. As you can see, you don’t have to dread trimming your dog’s nails. It can be quite a pleasant procedure. The key is just to pick the right tool and you—and your dog—will look forward to these nail cutting sessions. It’s extremely important to find a dog nail clipper that ticks all the right boxes where performance, safety, and comfort are concerned. Only then are you guaranteed a stress-free process. So, why not pick one of these and cut down on unnecessary trips to the vet and costs? Your pup will be much calmer when you’re the one taking care of it. 1 Is Clipping Your Dog’s Nails Really Necessary? 6 What Are Dog Nail Clippers Made Of?